I found this article very interesting, as well as the feedback it received. 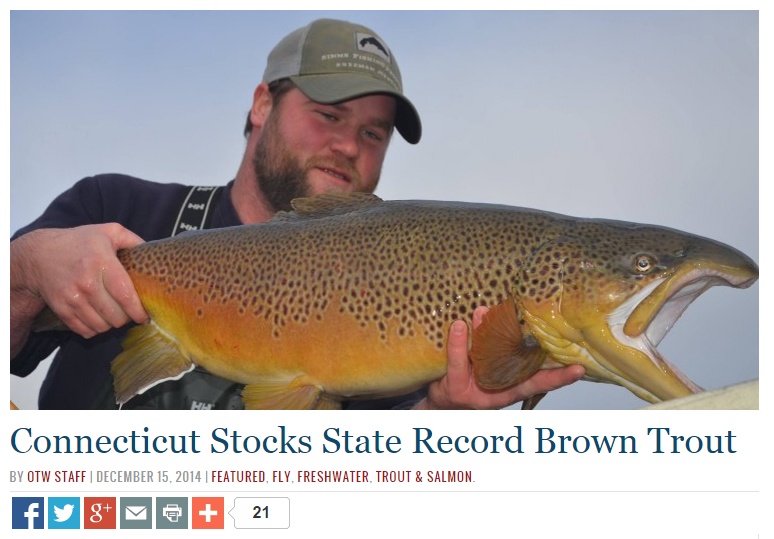 Basically, in case you skipped the article, Connecticut will be stocking 400 giant brown trout into various bodies of water across the state. Now here’s where it gets interesting:the trout average 15 pounds (yes, 15 pounds! ), and a many will exceed 20 pounds! That is bigger than the current CT state record. So I read the comments on this article, other articles, and asked around, and the feedback was mostly negative. I personally have mixed feelings about this matter. On one hand, no, I don’t like that some guy chucking Powerbait can suddenly catch the new state record brown trout, and take it from someone who caught an 18 pound trout that grew and grew and grew and grew, until it was the biggest fish around. But I see a lot of positives out of this too. Personally, I’d love to catch a double digit trout, especially since that is very hard to do in MA. I think that this stocking will help the state make some serious revenue, because anglers are gonna want to give it a shot. I bet a bunch of anglers who live close by will make the drive, pick up a CT license, and give it a shot. I think it does provide a neat opportunity for anglers. I think as a compromise, they should have considered stocking the same amount of trout, but in the 10-15 pound range. Make the trout work to put on those final 5 pounds, to make them a record. But I like the idea overall, despite the problems with there being new records out there. And I am actually not sure where they are being stocked, but I assume it will be mostly in deep reservoirs. But I think it would be cool to see a few double digit browns in some of the larger rivers. That would really get some fly fishers excited. Now even if you wouldn’t fish for these big, stocked fish, I am still interested to hear what you guys think about this program. Good or bad overall, for the state and the anglers? Good for the state, but bad for the fish that inhabit the stocking sites and also bad for the browns being stocked. The fish in the stocking sites will be impacted by the normal negative effects of stocking, but magnified because the fish are larger (eat more smaller trout and baitfish) and there will be increased angler traffic, which is also harmful to the stocking sites. This policy will bring in more money to the state, but it makes the records inflated and nearly meaningless. Also, I lost some respect for CT because they have been trending in the right direction with WTMAs, but this decision is clearly not for the benefit of the environment. It is for the benefit of their budget. Also, how are these browns supposed to find sustenance? They have no instincts because they are bred in hatcheries with watered down DNA and need a lot of food to survive. Most will die within a few weeks in my opinion. That was a question I had too. With these trout getting big, fat, and lazy from sitting in a hatchery tank eating pellets, are they going to have the instincts to hunt down the big minnows they need to survive? I don't think so. And I liked your points from the your first comment, about the negative effects. The angler traffic will be a serious negative on some of these bodies of water. But I don't know, I think that some anglers are going to benefit. Or not benefit, but they are going to have fun targeting these giants. I just wish there was a way so that they didn't have to have such an effect on the environment. And check out the CT Fish and Wildlife Facebook page for some more information. It seems like these are basically like broodstock salmon (like the ones we had stocked here in MA). Retired hatchery fish and such. And people are already catching them, so I guess they they do have some instincts to hit minnows. It'll be interesting to see how this plays out. And one more thing – I was reading a bunch of comments, and found a few points I agreed with. I would rather see 400 brown trout stocked between 4-5 pounds, than double digits. These will satisfy anglers without having such an effect (hopefully). And a 5 pound brown trout still puts up a fight! And, I would rather see the 15 pounders in C&R areas, that overall are more stable and could sustain them. I know wild brookies will never reach 15 pounds or even 5 pounds, but if the CT FW continues to expand their protection of wild fish and starts doing habitat improvement work then you will see larger brook trout in the 12 to 15 inch range that will provide excitement for anglers. The capability is still there. How do you think these brookies grew to 15 inches on a regular basis 100 years ago? The answer…less habitat degredation and stocking. Also, if wild trout management area was made on part of the upper Farmy, then huge native brookies would start thriving. Even with the current heavy angler traffic and stocking there are some large wild brookies on the Farmington. Look at the Small Stream Reflections blog posts from August. Now I'm not saying that brookies are going to grow to trophy size. I just think there are better, more sustainable ways to develop populations of large trout. If these large browns are being stocked in ponds, then I don't have an issue and it will provide angler excitement. If they are stocked in rivers, then it's a problem. Yes, you have a point there. I suppose a big, deep pond would be much more sustainable for these big guys. And I agree with your other point, it would be better to put into place C&R zones and restore the current habitat so the trout that are already out there can grow bigger, rather than just stocking over. The Farmington especially.